With two new exhibitions and a collection of awards, artist Haroon Mirza is making waves with his eerie remixes of art and audio. 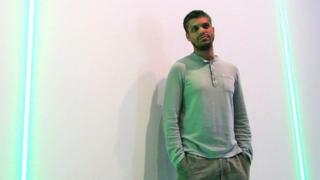 When Haroon Mirza was a child, he used to take his toys apart so he could see how they worked. "I used to get bought toys and they'd be taken apart within days and then my parents used to go mad," he says. "My sister had this speaking doll, so I took it apart and inside was this amazing disc, like a record, with grooves in it and that's how she spoke. "I used to try and fix things and, perhaps not knowing how to fix them, I'd make them into something else." Now 36, Mirza is no less inquisitive and has made his name as an artist who likes dismantling the world around him, obsessively examining the elements and reassembling them as something familiar but strangely skewed. "Taking things apart and being inquisitive about how things worked was something I just did habitually as a kid," he says. "I don't know why. "It wasn't art when I was a kid. It was something else and it's only art now because it's in the context of an art gallery." Mirza came onto the radar when he won the Northern Art Prize in 2011 for an installation that put sound from vintage record players and radios next to projected film clips and an existing Victorian painting. Later that year, he won the Silver Lion for most promising young artist at the Venice Biennale, followed by the Daiwa Foundation Art Prize in 2012. Two solo exhibitions have just opened at the Hepworth gallery in Wakefield and at the Lisson Gallery in London. He also has a work on display at Tate Modern and will be featured in the Museum of Modern Art in New York's first major sound art show from August. In the Hepworth, Mirza has traced shapes from the gallery's architecture using strips of brightly coloured LED tape that is normally found in shops and hotels. The tape itself is usually hidden, with only its even, warm glow visible, but some showy shop windows will use it in its stark glory, Mirza says. "You see it in kebab shop windows and pound shops or whatever in their window displays." The artist says the LED strip is the natural successor to the neon light, which artists first appropriated from shop and hotel signs decades ago. "From Bruce Nauman to Tracey Emin, it's the same thing. In one situation, outside a hairdresser's, a neon light operates in a very different way. So it's interesting to bring this sort of material, which is a ready-made and a prolific material, into this context." In an adjacent gallery, Mirza has amassed a small army of humanoid sculptures made over the years by artists including Lynn Chadwick and William Turnbull, which he has found in the Wakefield art collection. They are lined up on the floor, walking together toward a curved mirror made by the artist Alice Channer, which acts to magnify this advancing battalion of scary figures. "There's something a bit alien about it," Mirza observes. On the other side of the curved mirror, a Henry Moore figure reclines on the floor, "making herself look thinner and staring at herself", as the artist puts it. The gaudy LED lights appear again, this time underneath a large 18th Century landscape painting by Philip Reinagle from the Wakefield collection, and under a group of three empty plinths, which Mirza found in the gallery store room and has assembled to form new sculpture. He is making the point that the figurines he has arranged on the floor do not need to be in these "pristine boxes". "This is how I found them downstairs," he says of the plinths. "I've chosen not to clean them up and paint them up. This has become a sculpture now." The LED lights flash in time to some strange noises emanating from the first room - oscillating pulses, jackhammer rumbles and modulated buzzes that come together to make something quite musical, if not quite music. At his other exhibition at the Lisson Gallery, Mirza's exploration of sound goes deeper. In one room, five turntables have been doctored with pieces of wood and strips of tape and copper to make different noises. As they start up apparently at random, a demented rhythm builds from their variety of groans, booms and squeaks. In another room, eight speakers are in a circle, all hooked up to a small central control gizmo. The unit has eight LED lights, one for each speaker, which flash as each speaker emits a noise. The result is a quite hypnotic robotic rave tune. Mirza is also a DJ and his audio collages from this exhibition have been remixed by Factory Floor and Django Django and released on vinyl. Mirza is playing with the question of when a piece of audio becomes music, when it is art and when it is just noise. "All music is organised sound or organised noise," he says. "So as long as you're organising acoustic material, it's just the perception and the context that defines it as music or noise or sound or just a nuisance." Haroon Mirza, /o/o/o/o/, runs until 29 June at Lisson Gallery. Haroon Mirza at the Hepworth Wakefield runs until 29 September.